and migomori 身籠 . 妊 means pregnant. People put up a new shimenawa rope for the shrine and place sacred branches in front of the sanctuary. From the hour of the wild boar to the hour of the snake seven days later they try to make no noise. a period of paying great respect to the deities. gave birth to the royal twins on the day of the snake at the end of this period. So people keep quiet to make her birthing easier. The priests of the shrine prepare special meals for the deities during this period. and ritual shoting occurs in the shrine compound (matoi 的射). After this ritual, spring was welcomed in the old province of Harima 播磨. There are other igomori rituals in Japan. A festival held from March eleventh to thirteenth at Tosa Jinja in Kōchi City, Kōchi prefecture. From the evening of March first the gūji (head priest) and shinshoku (shrine priests) enter into a period of monoimi (purificatory abstinence) On the afternoon of the twelfth a pair of chopsticks made from peeled haji (wax tree) branches is added to a container filled with steamed brown rice called mikinehan (thrice-pounded rice). A rite is performed in which a special shinsen (sacred meal) is offered to the kami. Early on the morning of the thirteenth after the main ritual observance, the priests partake of a naorai (sacred communal meal). The head priest grasps some of the steamed brown rice that had been removed from its place of offering with chopsticks that have been broken in two and eats it. Then the other priests eat a portion of the brown rice in turn. 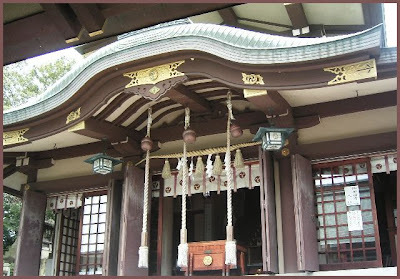 In previous times after the ritual observance in front of the sessha (branch shrine) Nishigozensha, the priest is said to have performed a rice planting rite called saitsukuri. The priests moved the shintai (sacred object) to which the kami's spirit had been transferred, carrying it next to the breast, and performed cold water ablutions in the sea. Since residents were not permitted to watch the movement of object and priests from the shrine to the sea and back again, the rite came to be called the nematsuri (sleeping festival) because the residents closed their doors and took to their beds. According to tradition, the people had to be discrete because the kami (saijin) worshipped at the shrine was originally a senior court noble who did not want to be seen because of his unsightly appearance. 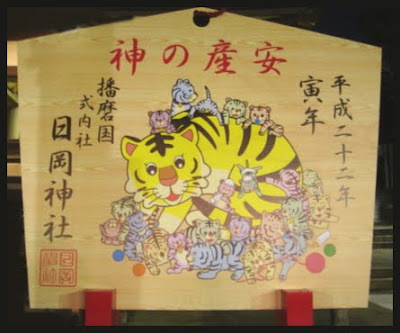 - this igomori (亥巳籠) rite puns on the igomori (忌籠) festival at Hisamaru Jinja. The character "i" in the latter case is usually read "imi," meaning purificatory abstinence or taboo . If the observances of the taboo were insufficient, Mt. Hioka was said to rumble and batsu (divine punishment) would follow. This shrine is famous for making prayers for a save delivery (anzan).
. . . CLICK here for Photos of ema ! 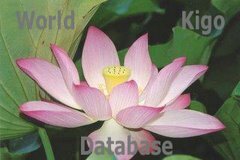 Talismans for Safe Delivery .
. imi 忌み / 斎み taboo in Shintoism . A son of Emperor Keikō, and father to Emperor Chūai. Yamatotakeru's mother was Ōiratsume of Inabi in Harima, the daughter of Wakatakekibitsuhiko, ancestor of the clan known as Kibi no Omi. Hour of the snake, from 9 to 11 in the morning. This is the time when snakes begin to leave their habitats. Traditionally in Japan, the day was divided into twelve intervals, each named after a zodiacal sign. 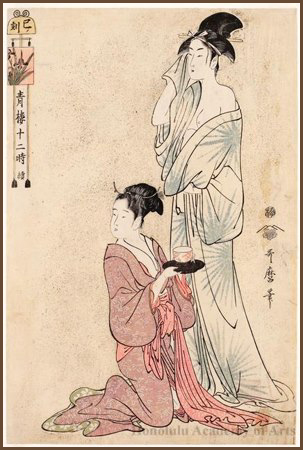 This way of telling time provided Utamaro with a clever schema for a series depicting the life of the Yoshiwara courtesan. A cartouche in the shape of a pillar clock contains the title of the series, and the individual hours are announced on the bell portion. The present print depicts the hour of the snake (9-11 a.m.), with a courtesan emerging from her morning lustrations to receive a refreshing cup of tea from a servant. The image of pampered courtesans in prints like this belies the sometimes harsh reality of their lives. Many courtesans were purchased from poor families as young girls, through a network of scouts that scoured the countryside for potential candidates. While successful courtesans enjoyed an education that brought not only literacy and social skills, but also many physical comforts, they also incurred substantial financial obligations. Courtesans had daily quotas of clients (which if they failed to meet, resulted in heavy penalties), and it was common for them to be in a state of perpetual indebtedness that resulted in virtual slavery.